Native American leaders say Trump's "Pocahontas" remark was "slur"
Navajo Nation, the National Congress of American Indians, and John Norwood, general secretary of the Alliance of Colonial Era Tribes, all spoke on President Trump calling Sen. Elizabeth Warren "Pocahontas" at a Monday event honoring Navajo war heroes, calling the remark insensitive. Norwood said the comment "smacks of racism," and Navajo Nation President Russell Begaye said it was "culturally insensitive." White House Press Secretary Sarah Sanders has said Warren's characterization of the remark as an "ethnic slur" was "a ridiculous response." Begaye, per the Chicago Tribune: "In this day and age, all tribal nations still battle insensitive references to our people. The prejudice that Native American people face is an unfortunate historical legacy." He noted that the Navajo Nation is still honored by Monday's White House ceremony. Norwood, per NBC: "The reference is using a historic American Indian figure as a derogatory insult and that's insulting to all American Indians." The President should "stop using our historical people of significance as a racial slur against one of his opponents." National Congress of American Indians, per NBC: "We regret that the president's use of the name Pocahontas as a slur to insult a political adversary is overshadowing the true purpose of today's White House ceremony. Today was about recognizing the remarkable courage and invaluable contributions of our Native code talkers." 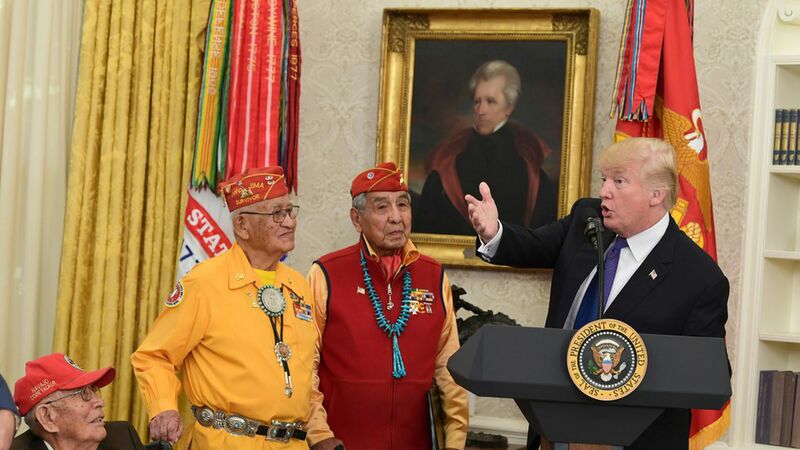 Worth noting: The podium where the code talkers spoke was set up directly below a portrait of former President Andrew Jackson, who signed the Indian Removal Act into law in 1830.